A little bit of backstory. In this world, the aftermath of the American Revolution went horribly awry, neutering the nascent United States in its infancy, while the French Revolution was even worse and created a Europe that at best resembles the USSR under Khruschev and at worst the USSR under Stalin. In this vacuum, Russia rose as the world's greatest power following the downfall of the British and French empires, and China later rose as the renewed great power to challenge it. Today, in the year 2084, the two democratic states face off in every way from outer space to cyber space, a rivalry that has spurred human technological and social development ever onward. The two mega-states flex their muscles across the world and beyond as the two powers, tentatively, make their way into outer space with all the dangers and riches that lie therein. It is not always a peaceful process, but it is one that is set to catapult humanity into a new age. 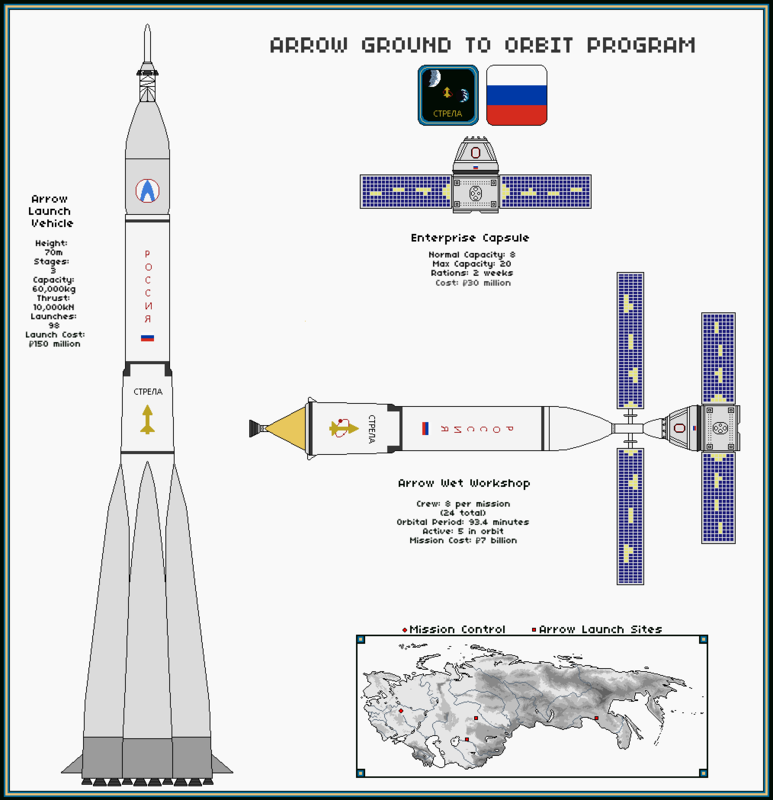 The Arrow (Стрела) Program is one of Russia's finest programs. It was designed to be the workhorse of the Russian rocket fleet, particularly as Russia, unlike China, does not have easy access to a space elevator. It has performed its job admirably, having enough power to get capsules as far as the first Lagrangian point. One of the very positive elements of the Arrow program, too, has been its ability to turn spent stages into orbital wet workshops to for various tasks like espionage, scientific discovery, and habitat experimentation. Russia typically keeps 5 habitats in orbit and uses more Arrow launch systems to relieve the crews and bring extra supplies (most of the wet workshops being self-sufficient at this point). While in 2084 the wet workshops are rather old and have been far outpaced by far fancier and newer stations, and the Arrow by much nicer ships, it continues to be a tried and true part of Russia's fleet. Here it is carrying an Enterprise capsule, a cheap and efficient capsule designed to work well with wet workshops and other orbital stations. Also, as a bonus, some videos showing off elements of the design from our own world.